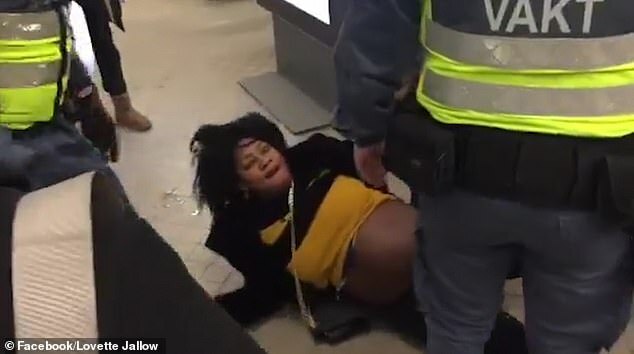 A video of a heavily pregnant black woman being overpowered by guards in front of her young daughter has sparked an outcry in Sweden. 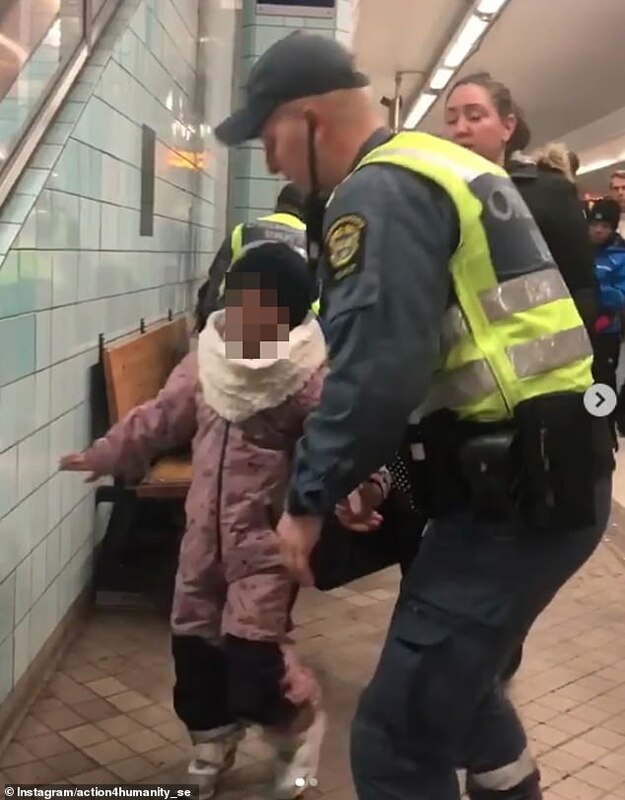 The unnamed woman was allegedly caught without a ticket on the metro in Stockholm before being dragged off the train. Activist Lovette Jallow shared the video on her Instagram, saying she 'wasn't surprised' that the woman had been 'racially profiled' and 'mistreated' - even if she was pregnant. In the clip, which has since been widely shared on social media, the woman is being pulled by two men as her young daughter walks behind with another woman. As the child puts her arm around her mother, the guards drag the woman further away and push her on to a nearby bench. Two guards pin her down while a third guard takes the child away to talk to her as she sobs uncontrollably. A second video shows the woman, with her pregnant stomach exposed, lying on the ground of the station as she is surrounded by guards. 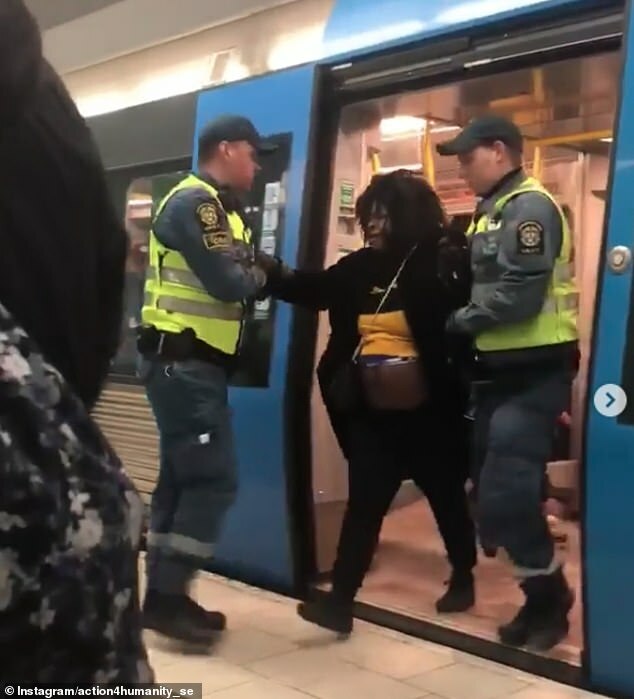 After the incident at Hotorget metro station, the unnamed woman, who is believed to be eight months pregnant, was rushed to hospital for treatment. The two guards have been suspended, and Swedish police are investigating the case as a potential assault. The woman is also being investigated for violently resisting the guards. Henrik Palmer, from Stockholm's SL public transport provider, told Swedish public broadcaster SVT that videos posted online 'suggest that the security guards were too forceful'. An SL spokesman told the BBC: 'What we do know is that the woman was caught without a valid ticket in a ticket check and was given a penalty fare. She refused this and therefore she, according to our rules, was asked to leave the subway.